TSK, tsk. Will people ever change? 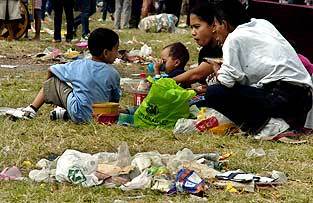 Why is it so difficult for us Filipinos to segregate garbage, or just throw refuse in the proper disposal bins? Leaving garbage strewn about is so 80s! Magbago na sana tayo...2011 na! This is the stinking garbage of EPIC, a new club in Boracay, sitting on the beach pathway on Jan. 1, 2010, after its New Year's party. The club is located on Station 2, where Hey Jude! used to be, and is owned by the same people who set up the controversy-riddled Embassy at The Fort, and now Republiq at the Resorts World. Why am I not surprised that these guys have bad habits? This island will continue to die w/ irresponsible entrepreneurs from Manila let loose. 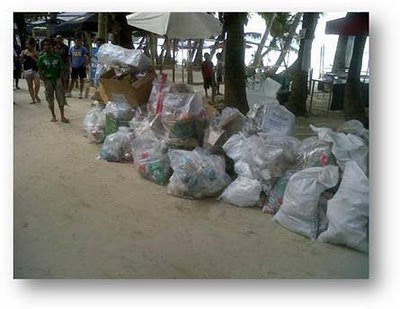 AND this is probably why, Boracay will probably not make it to any foreign publications' travel list this year. It has become ordinary. Commercially overdeveloped, noisy, and dirty. I used to call the island my second home in the mid-80s to early 2000s. Now, it's just so sad to go there esp. during peak season. But at least there's still one Philippine destination that made it to National Geographic's 20 Best Trips of 2011. Palawan.